Nicholas Holmes, a senior in the EMIT (Engineering and Manufacturing Institute of Technology) program at Forest High School, has achieved the rank of Eagle Scout, the highest rank in Boy Scouts. 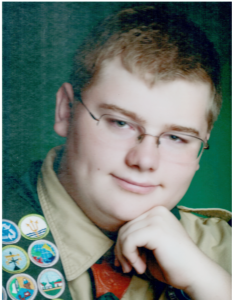 This accomplishment is the culmination of over six years of adventure, fun, work, and dedication to the Boy Scout program for Holmes, a member of Troop 200 in Ocala. Holmes led his group of over 25 volunteers in the building of three planter benches, a fountain and a free-standing circular waterfall wall. His project involved a total of 273 volunteer hours and over $1,400 worth of materials and supplies. Holmes and his volunteers didn’t stop upon completion of his approved Eagle Project. They also pitched in to help ready Charlie’s Garden for its dedication by planting new bushes and flowers to replace ones killed by frost, building the archway entrance to the garden, pressure washing the sidewalks and seating areas in the garden, and refinishing the donated cast iron tables and chairs. Along his trail to the rank of Eagle Scout, Holmes has performed countless hours of community service, while simultaneously providing service and leadership to his troop and his church. He has earned 26 merit badges along the way, from camping to wood carving. Holmes will be formally presented the Eagle Scout award at a Court of Honor ceremony on November 9 at 7:00 p.m. at The Church of Jesus Christ of Latter-day Saints in Ocala.